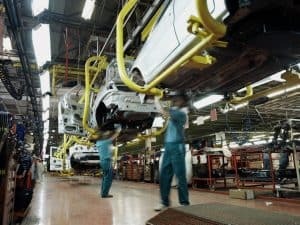 New data published by the Society of Motor Manufacturers and Traders (SMMT) has revealed the UK automotive sector achieved its highest annual turnover to date last year. According to the organisation's findings, the sector achieved a total turnover of £77.5 billion in 2016. The good news didn't stop there though, with overall vehicle production numbers up by 8.9 per cent in comparison to the previous year, while the volume of water consumption, energy use and waste sent to landfill all diminished. Responding to the statistics, SMMT chief executive Mike Hawes stated: "Today's results demonstrate how UK automotive is delivering growth across the UK, boosting productivity and improving environmental performance. This has been driven by massive investment, in new models, plants, innovation and one of the world's most skilled workforces." However, a word of caution was added by the SMMT chief, who argued that for UK automotive manufacturing to continue to thrive, there now needs to be increased clarity on the future of the industry beyond the UK's exit from the European Union. Mr Hawes concluded that ongoing investment and growth must remain a top priority to see these positive gains reinforced in the years to come. Molly Benton, brand manager at Fuel Card Services, adds: "To see the UK automotive sector continue to go from strength to strength gives us great confidence for the future, whatever new challenges the outcome of Brexit may bring."